Next we have our main activity. 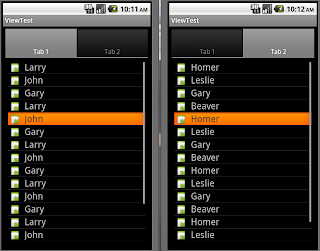 I created a method called switchTabs(boolean direction) to tell tabhost which direction to switch tabs. 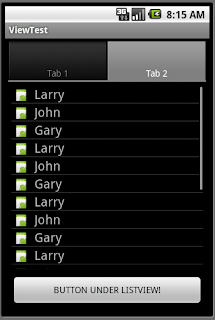 I also implemented a listener on tabchanged. Once a tab is changed, the listener is fired and I then change the content on listview. Next we have the heart of the content; the listview. The goal is to allow the user to swipe left and right and our program would switch tabs. Although, we have to make sure we did not remove the functionality of clicking on an item and scrolling up and down on list. On my first attempt, I made an @Override onTouchEvent(MotionEvent event) and I tried to handle the swipes. The problem my implementation had was if the user swiped, the item on the next tab would automatically click after user lifted their finger. As such, I had to find an alternative. This is where GestureDetector came in. This class gave me the ability to analyze the touch event. I kept the original @Override onTouchEvent(MotionEvent event), except I passed the event to the GestureDetector and let the class handle the left and right swipes. If the GestureDetector analysis of the touch event appeared to be anything other than left or right swipes, let ListView handle it (ex. scroll up and down as well as clicks). The result was the functionality I was looking for. The XML layout includes a tabwidget, listview, and a button. 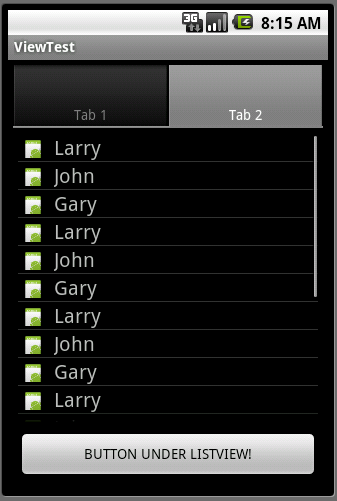 The trick here is android:layout_weight="" which indicates which widget will take up portions of the screen. I also added a button which took up another portion. 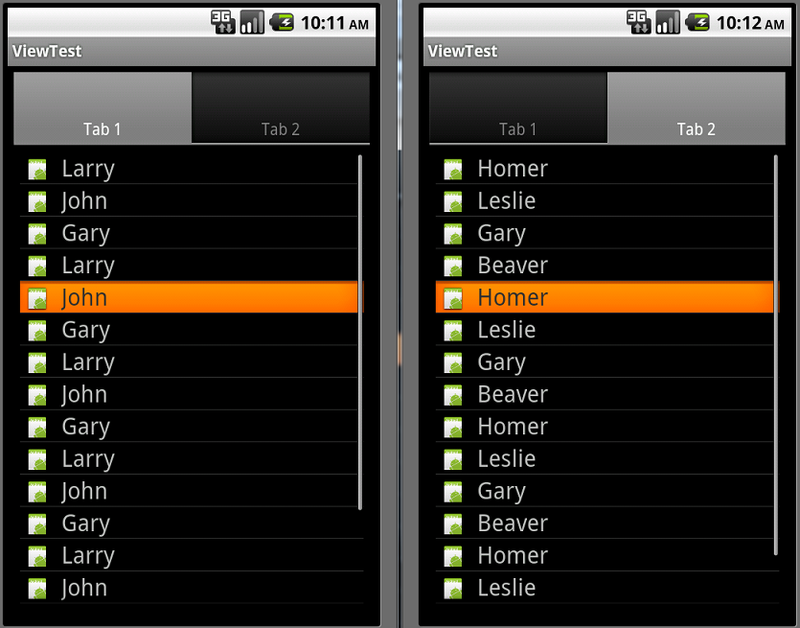 When it comes down to FrameLayouts, you have to indicate the weight to determine how much of the screen it will take up or else some widgets will appear to float infront of another, which is the nature of a framelayout. The problem is Tabhost needs to have a Framelayout for its content of the tabs and this was a way I found to add button. Linear Layout and Relative layout did not work for me. If someone has a better way, please feel free to share. Here is the result of code above. Enjoy!